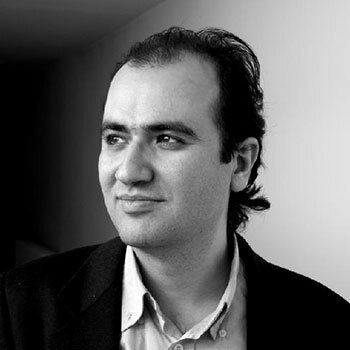 Onur Türkmen was born in Eskişehir, Turkey in 1972. In 1990 he moved to Istanbul to study environmental engineering at Istanbul Technical University from which he is graduated in 1999. In 1995 he attended Berklee College of Music in Boston and graduated in 1998. He completed his master and doctoral studies at Istanbul Technical University’s Center for Advanced Musical Research (MIAM). The title of his doctoral dissertation is: “Contemporary Techniques applied to Turkish Music Instruments”. He is currently teaching at Bilkent University Music and Performing Arts Department. He is also the writer of the Bilkent Symphony Orchestra performance notes. His pieces were performed by many different ensembles including Duo Arcobaleni, Istanbul Modern Music Ensemble, Bilkent Su Trio, Adapter Ensemble, University of Memphis Contemporary Chamber Players, Razumovsky Ensemble, Bilkent Ensemble, Trio Fem, Duoist and Anahata Ensemble. He’s latest commissions include a piece for Hezarfen-Yurodny collobration for the Arts Council of Ireland and his piece “Lines for an ensemble” will be performed at ISCM 2012. He gave seminars, lectures and attended to panels on following subjects: “The Evolution of Polyphonic Texture and its Absence in Turkish Music”, “Model Designs for Guitar in Just Intonation”, “Stravinsky and Renaissance Music”. Hat Hat (term derived from calligraphy) is a compositional approach that is not constructed through a dialectic on the oppositions, contradictions and polarizations of the musical material(s) but rather on a dialectic between composers psyche and hat. Hat – a “line” of maqams penetrating and merging into one another – is gradually sought, communicated with and eventually revealed by the composer. Being inextricable from its single unity, this line is only a phenomenon restricted by composer’s seeking, communication and revelation. Therefore its beginnings and endings are ambiguous; it is not a structure; any instance that occurs within the hat does not dictate the existence of another consequent moment. Although there are reminiscences, a hat does not incline towards a reference to a certain culture. Rather it is just another occurrence within a universe with no other diversity than itself: a simultaneous unity of time and space that ceaselessly continues and expands. Speaking of a universe of no diversities, in terms of musical perspective, hat is emancipation of consonance.